This Rainbow Rasgulla is bursting with flavors, textures, and colors, just in time for Holi! 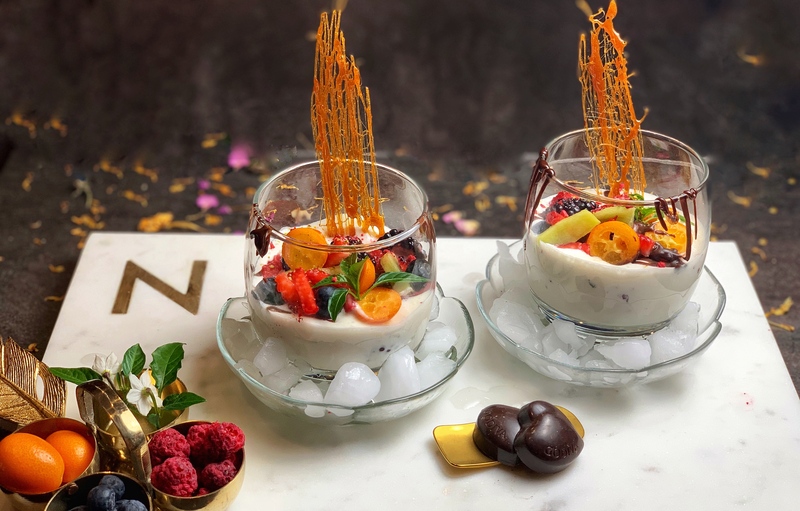 With fluffy rasgullas perched in a vanilla ice cream base with fresh fruits and chocolate to top it off, the decadence of this fun twist on a classic dessert is undeniable!! It’s super easy to make and only requires a few accessible ingredients! Whisk together some vanilla ice cream until it’s fluffy and add in some rasgullas. Garnish with fresh fruit of all colors, chocolate shavings and drizzle, and spun sugar. The combination of sweet and sour or crunchy and creamy creates a gorgeous melody of flavors and textures. Full of life and vibrant to not only eat, but also to look at, serve this to your friends or families this Holi to add some color to their day! This Rainbow Rasgulla is bursting with flavors, textures, and colors, just in time for Holi! With fluffy rasgullas perched in a vanilla ice cream base with fresh fruits and chocolate to top it off, the decadence of this fun twist on a classic dessert is undeniable!! Serve this dessert to your friends or families this Holi to add some color to their day! Prepare 3 large bowls. In one add ice water, add your rasgullas (with the sugar syrup discarded) in the other and semi-melted vanilla ice-cream (3/4 pint) in the last one. Take one rasgulla and wash it with the ice water and lightly squeeze out the sugar syrup. This will make it nice and fluffy. Put it in the vanilla ice cream bowl. Repeat this with the rest of the rasgullas. Change the water when it becomes cloudy. Add the rest of the melted ice cream (1/4 pint) into the same bowl and press the rasgullas so they are fully submerged. Chill the bowl in the freezer for 4-5 hours. Decorate with the fruits, mint leaves, pistachio, freeze dried raspberry powder, chocolate shavings, melted chocolate, and spun sugar (or praline). To make spun sugar, melt about 3 tbsp sugar on medium heat and turn the gas off when it becomes light brown. Stir vigorously to cool and the color will slightly darken. When it becomes more viscous and thickens, drizzle some onto a piece of parchment paper by moving a spoon back and forth quickly. Pop it in the fridge for 5 minutes and it’s ready to go! Any fruit works well as a garnish for this dish as it just adds some acidity to balance the sweetness. Even fruit syrups would work really well. Instead of spun sugar, you can use praline or anything other crunchy ingredient you want. Beautiful! How long can you store before serving? Thanks! You can store it for 2 days before adding the fruits.